Type-304, 22-gauge (0.8mm) stainless steel with satin finish. Door secured to cabinet with a full-length stainless steel piano-hinge. Equipped with a tumbler lock keyed like other Gamco restroom accessories. 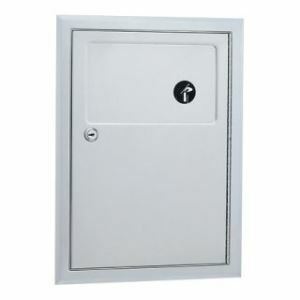 Unit is equipped with a self-closing panel covering each disposal opening. Type-304, 22-gauge (0.8mm) stainless steel with satin finish. Door secured to cabinet with a full-length stainless steel piano-hinge. Equipped with a tumbler lock keyed like other Gamco restroom accessories. Unit is equipped with a self-closing panel covering each disposal opening. Napkin disposal is emptied by opening door with furnished key and removing waste receptacle. Mounts in toilet partition 1/2" to 1-1/4" (13 x 32mm) thick, centered through a cutout specially ordered from partition manufacturer or field cut. Dimensions of cutout are to be 11" wide x 15-1/2" high (280 x 395mm). Receptacle shall have a capacity of 1.2-gal. (4.6-L). Unit 12 3/4" W, 17 3/16" H, 4 1/16" D (325 x 435 x 105mm).